Dovid’s face and his melodious voice became familiar to many after clips captured him singing several songs began to circulate. He was a precious neshama and talented composer with a gorgeous voice. 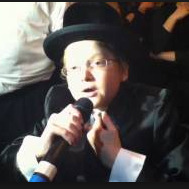 R'L Dovid was niftar June 17, 2012 after a five year battle with cancer. Hundreds of people thronged to the Skver Beis Medrash in Borough Park to attend the levaya of the fourteen year old Israeli boy whose beautiful middos and golden voice captured the hearts of countless listeners.